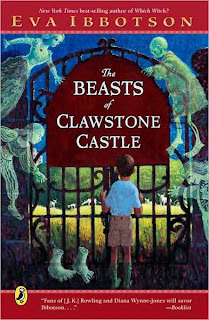 After the success of Ibbotson's The Haunting of Granite Falls as a Halloween-season read-aloud to my children this month, we chose this as our next read, and it was a hit as well. Rollo and Madlyn, brother and sister, are sent to stay with their elderly Great-Aunt Emily and Great-Uncle George, who live in an ancient, moldering castle in northern England. Emily and George aren't too keen on the idea, as they have worries of their own - financial ones, as the castle requires so much upkeep - and they are not very experienced with children. But Rollo and Madlyn are not average kids. Madlyn is immensely capable, responsible, and resourceful, and Rollo is intelligent and very compassionate when it comes to animals. Uncle George realizes, when he sees how much Rollo adores the wild white cattle of Clawstone, that he has found a kindred spirit. When they realize that their aunt and uncle are in dire financial straits, the children act immediately. Their scheme to restore the castle involves recruiting some proper ghosts to haunt Clawstone - so tourists will come to Clawstone on Open Days, instead of to selfish, wealthy Lord Trembellow's beautiful castle. And after auditioning many interested ghosts, the children take on the best of the best. Among them is the bloody bride, and the ghost who has the ghost of a rat gnawing on his heart (it produces a most wonderful effect when he opens his shirt to castle visitors), and - my girls' favorite - The Feet. Things seem to be going well until the wild white cattle are threatened in a most insidious way. The children uncover a heinous plot, but by the time they realize what is happening, they are far from their aunt and uncle, far from the safe, stone walls of Clawstone, and completely on their own. Ibbotson never fails to deliver a gripping, entertaining, and touching tale. Her protagonists are believable and sympathetic, and the villains are delightfully over-the-top horrific. The ghosts are simply wonderful, gory and gruesome, yet lovable all the same. The pacing is tight, but never too focused to spare a moment for a quick, fun side story about a minor character or two, and the plot takes wonderful twists and turns that are sure to keep readers guessing. The novel makes for an excellent read-aloud, and the girls and I are planning on more Ibbotson bedtime reads. Books for Kids Blog: "Eva Ibbotson's characters are somewhere between spooky and spoofy, with plenty of the YUCK but not too much of the YIKES factor." On My Bookshelf: "Ibbotson, as always, is very, very funny in a dry, witty way that I really enjoy. I would definitely recommend this, as well as her other books." This sounds fabulous. I wanted to ask if you'd read A Drowned Maiden's Hair? I just reviewed it -- and I think you and your girls might really enjoy it if you haven't had a chance to read it yet. It would also make an awesome read-aloud. And Eva Ibbotson recommends it! Kiirstin - I listened to the the audio version of A Drowned Maiden's Hair a year or two ago and loved it. That's a great idea for a read-aloud - we'll do it next Halloween! Kailana - You absolutely do! I think you'll love her books.